By Physicians for a National Health Program. Repealing the Affordable Care Act without replacing it, as some conservative hardliners are demanding, would cost a minimum of 37,127 lives over the next two years (14,528 in 2018 and 22,599 in 2019), and perhaps as many as four times that number, according to scientific studies summarized in an editorial in this week’s American Journal of Public Health. The new analysis of the effect of widespread insurance loss is particularly relevant in light of the report issued March 13 by the Congressional Budget Office. The CBO estimates that the American Health Care Act, the Republican plan to replace the ACA, would cause 14 million people to lose insurance in the first year alone. By 2026, 24 million would lose coverage, leading to a total of 52 million uninsured in that year. In contrast, the editorial’s authors estimate the impact of replacing the ACA with a universal, single-payer health system, along the lines of the Expanded and Improved Medicare for All Act, H.R. 676, would provide immediate coverage to the 26 million Americans who are currently uninsured, saving at least 20,984 lives in year one. Longtime health system researchers Drs. David U. Himmelstein and Steffie Woolhandler analyzed all of the peer-reviewed studies of mortality associated with losing or gaining insurance. 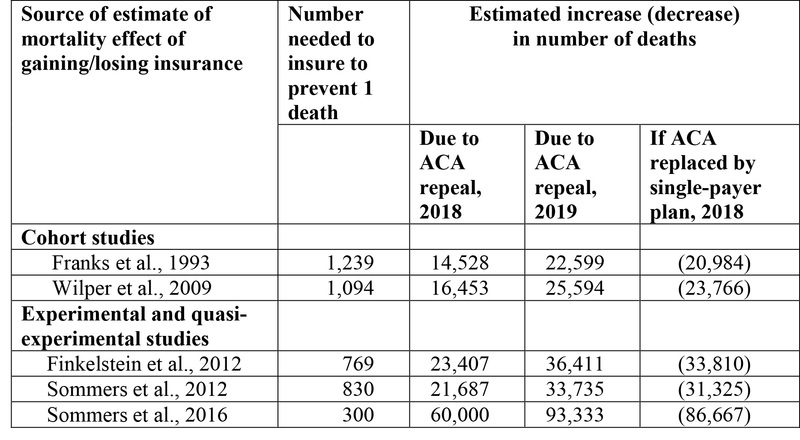 Using the CBO estimates of how many people currently lack insurance and how many more would lose coverage if the ACA were repealed without replacement, they provide a range of estimates of the excess deaths or lives saved under different health reform options (see table below). The evidence indicates that one American dies for every 300 to 1,239 who go without health insurance. Drs. Woolhandler and Himmelstein authored one of the early studies of the lethal effects of lacking health insurance, which President Obama cited in his push for the ACA. They, together with then-Harvard law professor Elizabeth Warren, led widely cited studies of medical bankruptcy. A copy of the full article is available to media professionals upon request from Clare Fauke, PNHP communications specialist, clare@pnhp.org, (312) 782-6006. The above image was taken in Washington, DC in October 2010. The figure was based on the number of people without health insurance at that time.